The Ordnance Survey Name Book suggests that Breasal is a man's name, but a connection with raddle, the red dye traditionally used to mark sheep, seems more likely. Brassel Mountain is the 350th highest place in Ireland. 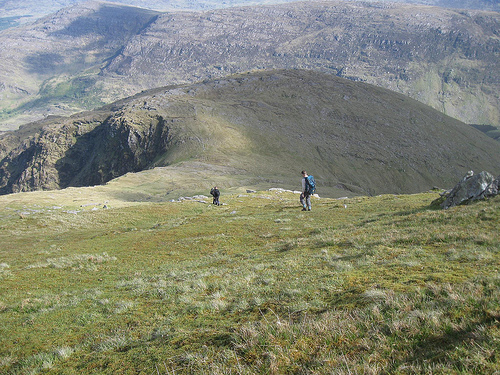 Brassel Mountain is the second most southerly summit in the MacGillycuddy's Reeks area. Brassel is very much the idiot half-brother of the MacGillycuddy family, and as such, is not likely to be climbed for it's own sake. For us, it came as the final top in a walk along the eastern ridge of the Reeks. From Cnoc An Chuillinn we retraced our steps to the saddle with Cnoc An Chuillinn East Top, and headed south, down wide mossy slopes that were kind to weary knees. Nearer the col the ground gets wetter, but it's a short and easy pull to Brassel's summit.